After sitting vacant for decades, this three-story turn of the century building needed a lot of love. Adjacent to The Tieton sat a single-story building which had most recently hosted a night club. The developer saw the great potential of the buildings as a mixed-use development providing retail and apartments in a great location – just off the Yakima Central Plaza which is currently under development. The developer brought in Lenity Architecture to help uncover that potential. 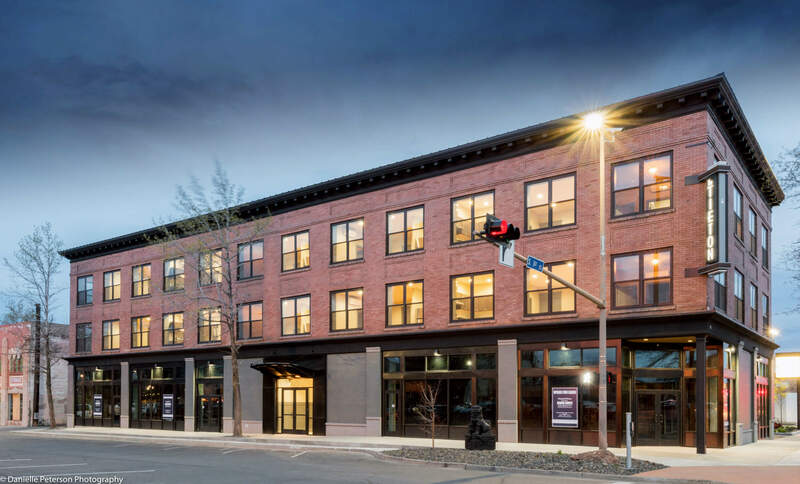 To maintain consistent forward momentum throughout the two-year project, Lenity divided the two buildings, adjacent parking lots, and right-of-way redesign into four phases. The first phase focused on the core + shell remodel of the newer single-story building to the south of the Tieton building and the small parking area at its frontage on First Street. 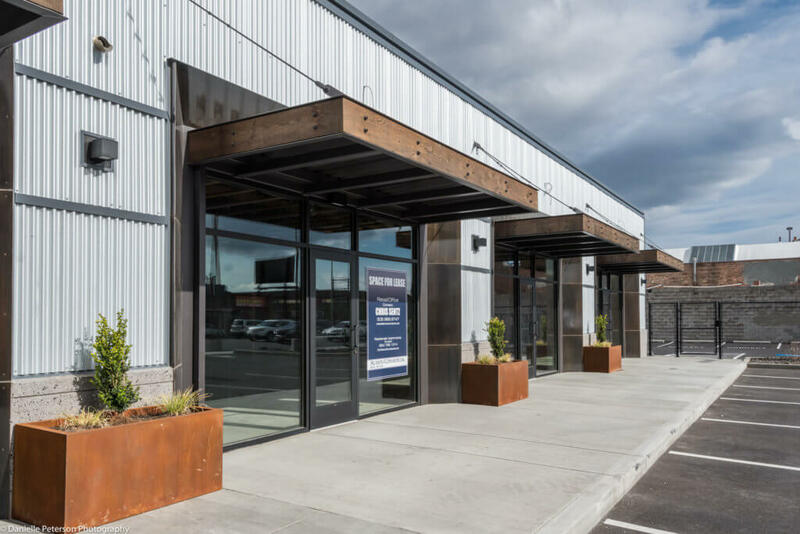 The 7,200 SF building was missing the historical interest of its turn of the century neighbor and the almost windowless concrete block mass provided a blank canvas for a contemporary interpretation of a retail façade. 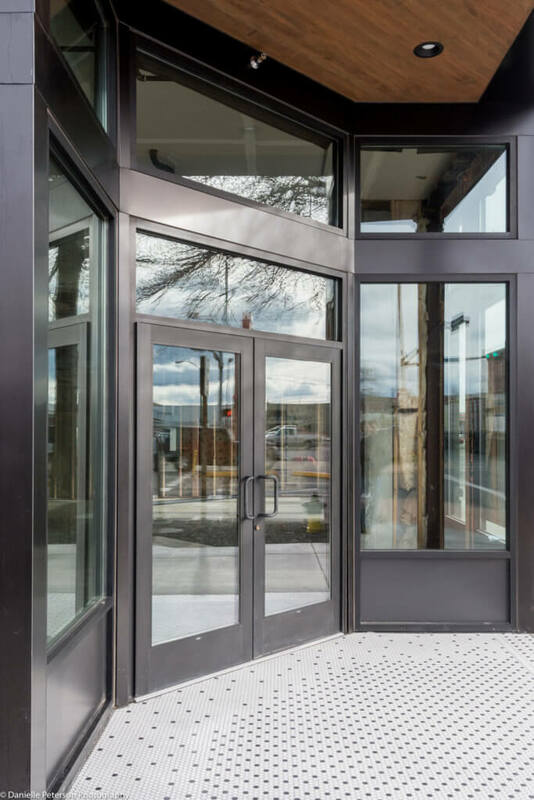 We stripped back the existing Mission-style stucco façade and opened up four large entryways which are set back into the wall with blackened steel frames. Each entry is covered with a steel canopy with wood accents salvaged from the Tieton. The remainder of the building is clad in bright corrugated steel which offsets the dark frames accenting the doorways. 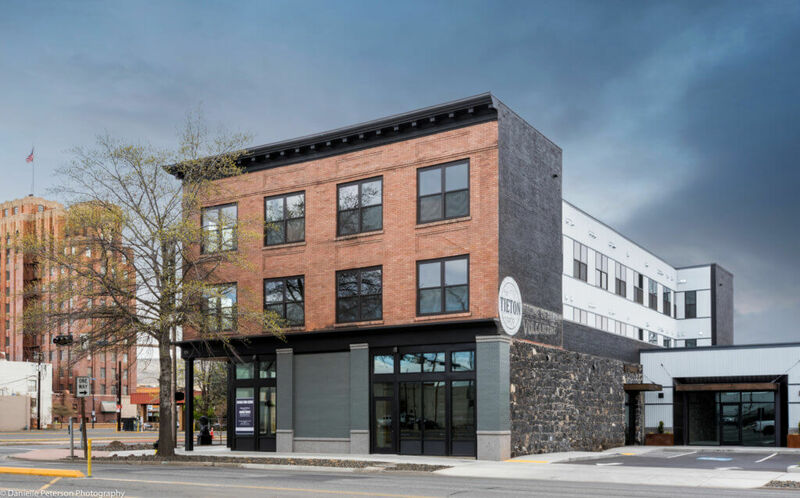 This building houses most of the utility services for the entire project while providing 6,000 SF of retail space in a prime downtown location. Phase II was underway at the same time as Phase I and focused on structural seismic preparations for the Tieton building. 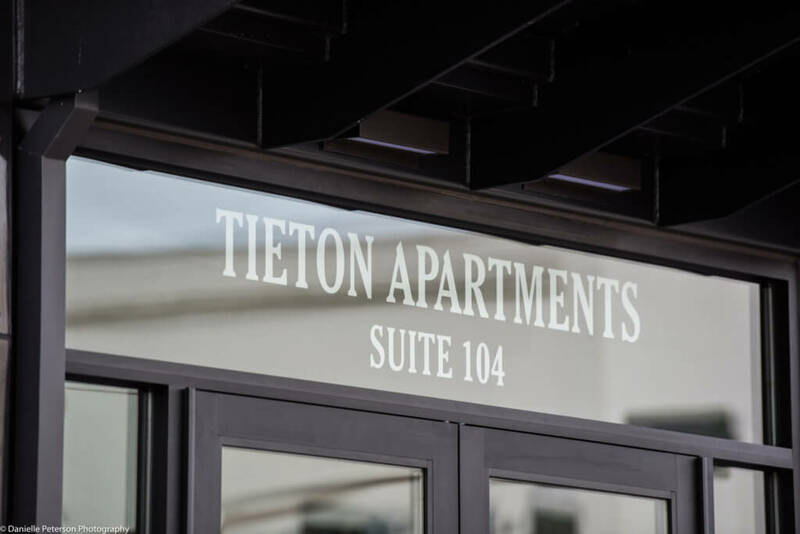 The Tieton was what is often called a ‘soft-story’ building, which means that a steel and wood post and beam ground floor (a soft-story) supports the more rigid brick upper floors. This can be disastrous in an earthquake. 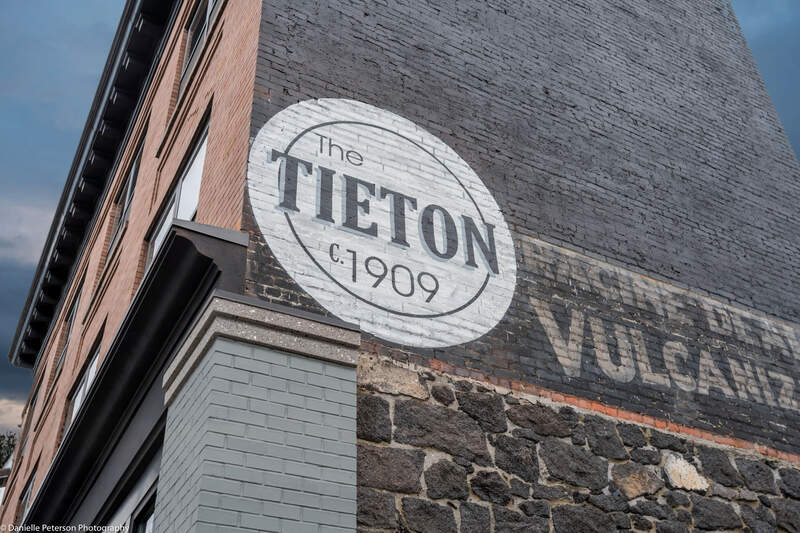 So, before any architectural remodeling of the Tieton began, we worked with a local structural engineer to balance requirements for solid, reinforced concrete, seismic walls, and the desired open ground floor aesthetic of a retail building. 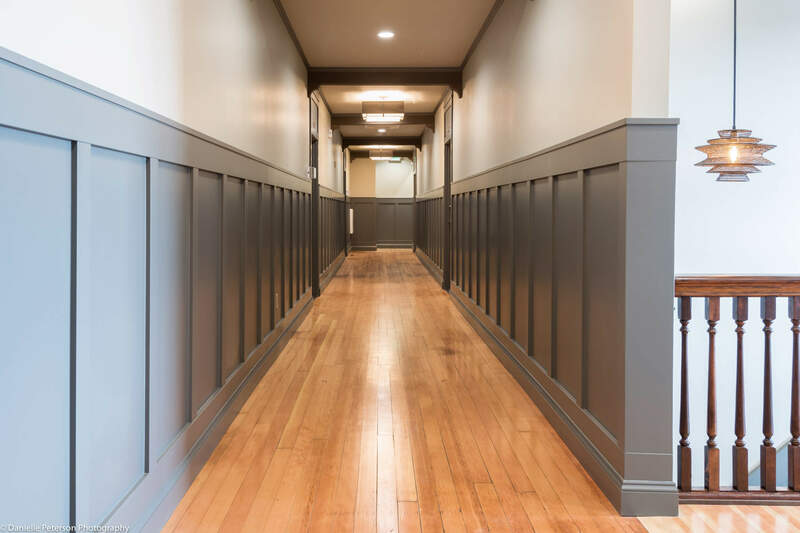 Working together, we were able to disperse the required seismic walls in such a way they balance and frame the openings, while remaining concealed behind existing, or new brick and stone walls, thus preserving the historic character of the building. Once Phase II was sufficiently completed the final phases were completed concurrently. This helped to maintain the project momentum. The third phase focused on exterior façade remodel for the Tieton building as well as 6,000 SF of ground floor commercial core + shell. 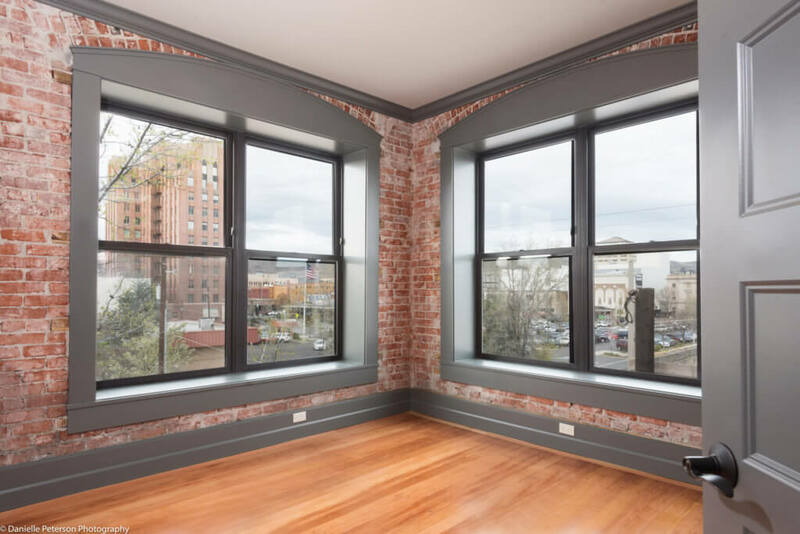 Phase IV included second and third floor interior remodeling to create 16 new apartments with grand windows and both downtown and mountain views. Phase IV also included a redesign of an existing parking lot to the south of the buildings to provide secured parking for the apartments, plus parking for the retail customers. The ground floor retail shell provided an open façade of storefront windows punctuated by brick columns and capped by a rebuilt cornice in the same style as the original. The street frontage was also reimagined to bring the sidewalk up to the level of the building providing accessible entrances at all suites and reinvigorating the previously neglected landscaping and public right-of-way. The original inset corner entry at First and Chestnut was uncovered, revealing the heavy steel column that had been hidden for most of the life of the building. 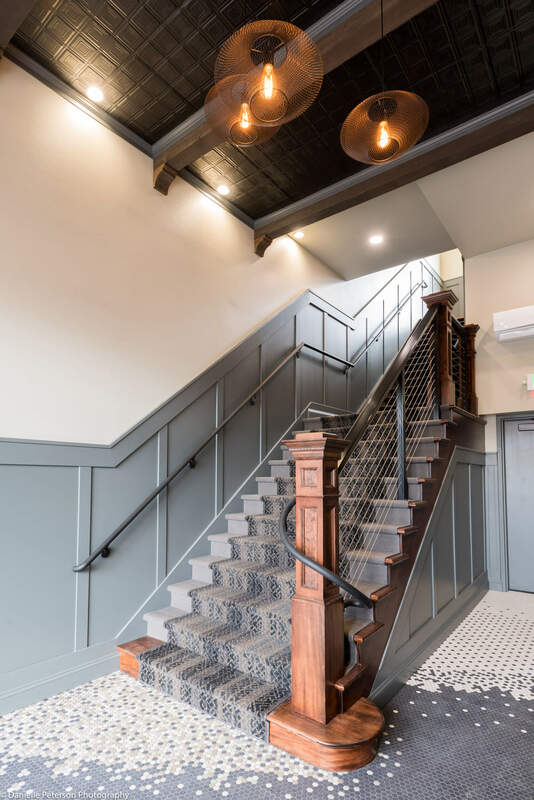 This new entryway was provided with a tile mosaic floor providing a nod to historic tile entries as seen on many old buildings, while offering a modern twist to the historic patterns. 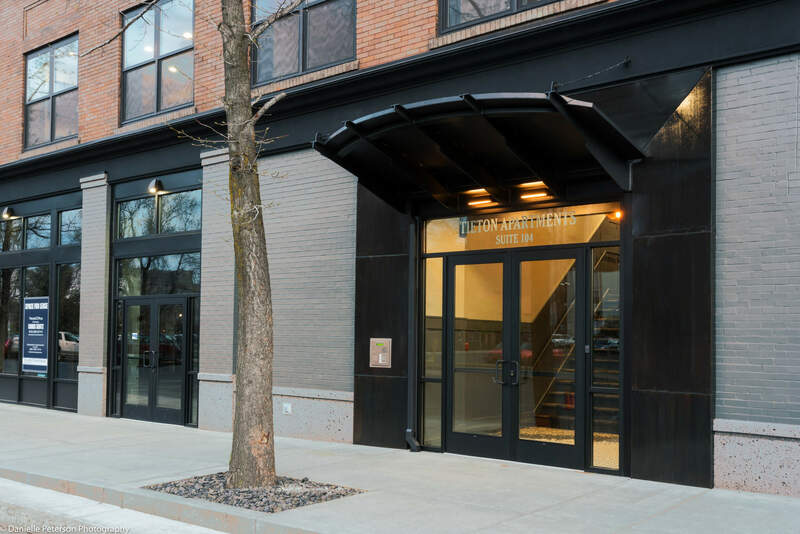 The exterior face of the front residential entry is reminiscent of the south building’s modern steel frames, aesthetically tying the two buildings together on opposite ends of the project. This is covered by a more streamlined steel canopy with an upward slope drawing the eye down to the doorway, while the frame draws the eye inward to the domestic comforts within. 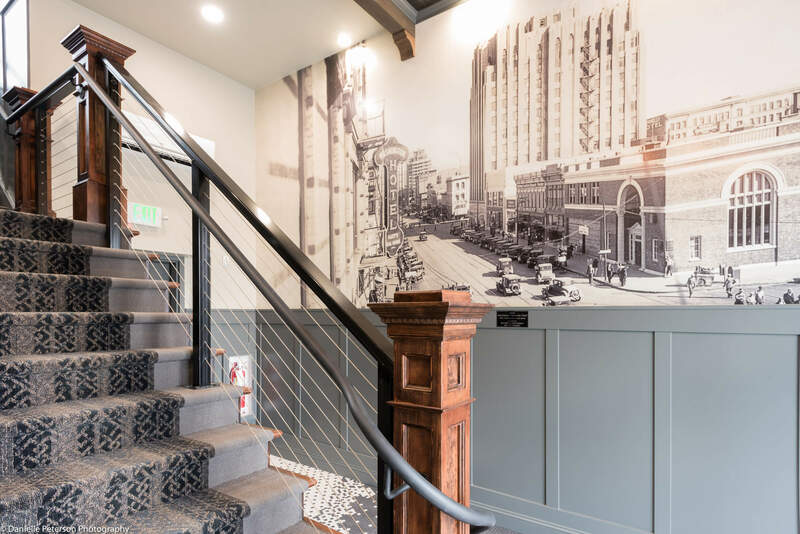 Once inside, the ground floor lobby features a mural based on an historic postcard of downtown Yakima, compliments of the Yakima Valley Museum. The lobby floor also showcases the mosaic tile patterns of the corner entryway. With more space for creativity, the pattern evolves further adding the colors of the carpet as it approaches the stair and darkening to a river of black flowing diagonally across the space before brightening again toward the back door. 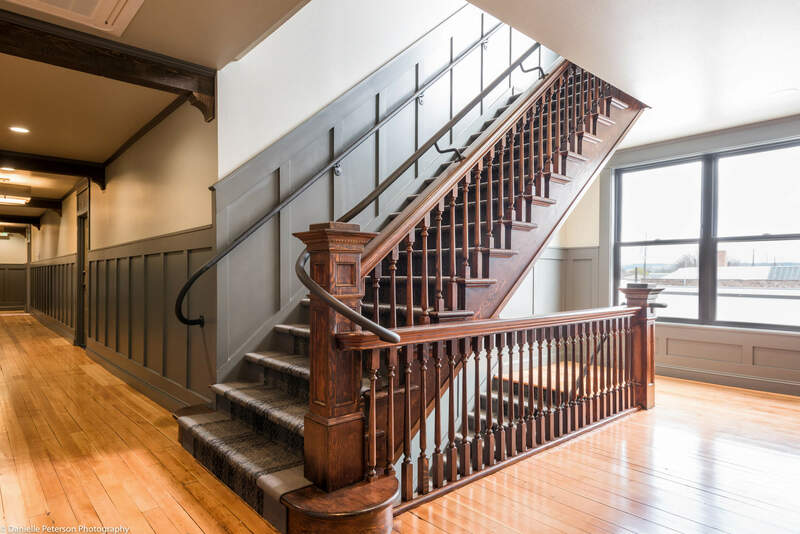 The residential stair and lobby feature the original wooden stairs, banister and newel posts, with a new steel handrail designed both to enhance safety and be stylistically appropriate. On the ground floor the original banister and newel posts had been lost to previous renovations. They were replaced with newel posts to match and a more modern stainless-steel cable guardrail. 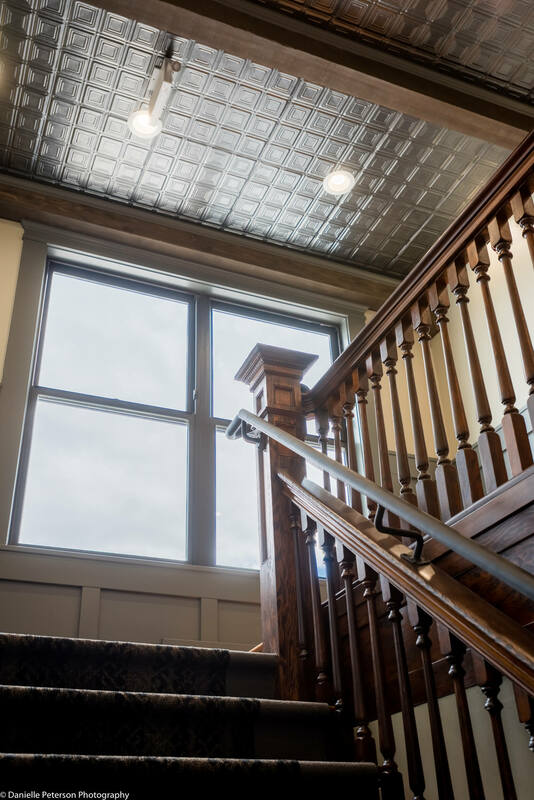 The third floor + ground floor ceilings feature pressed tin paneling and rough-hewn beams reminiscent of the turn of the century style. The bright and open apartments feature an industrial chic aesthetic. 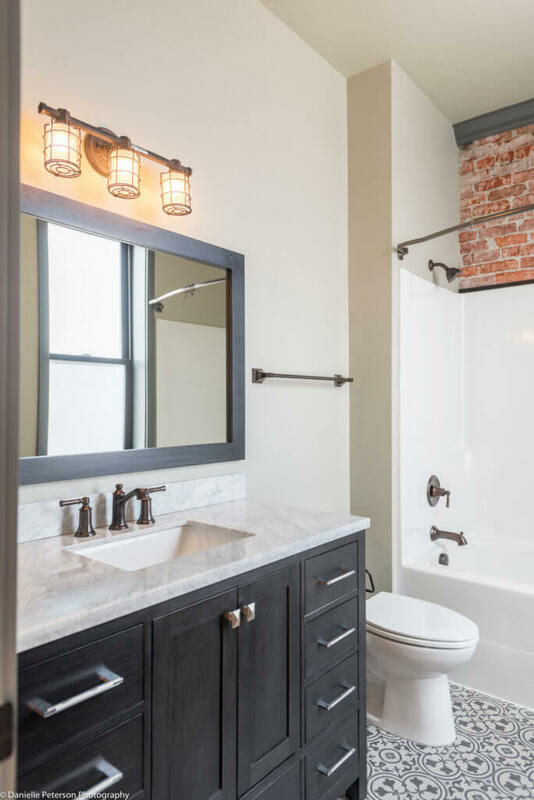 It began with uncovering and featuring the existing brick walls and hardwood floors, as well as making ample use of the giant 7’x7’ square window openings. 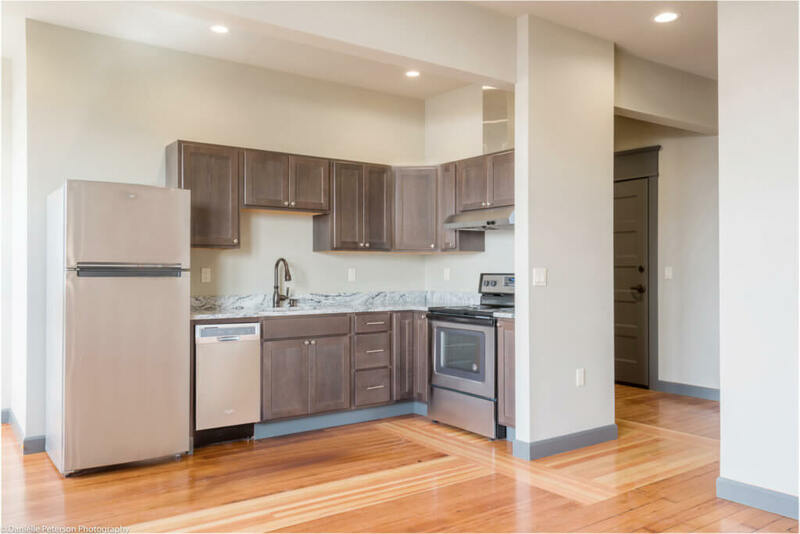 There is a two-bedroom apartment + seven one-bedroom apartments on each floor, each providing a modern kitchen, bathroom, laundry facilities, and an open living room. The bedrooms provide ample closet space, many of them include walk-in closets. Much of the detailing of this project was inspired by the building itself as we sought to uncover and enhance its inherent beauty. 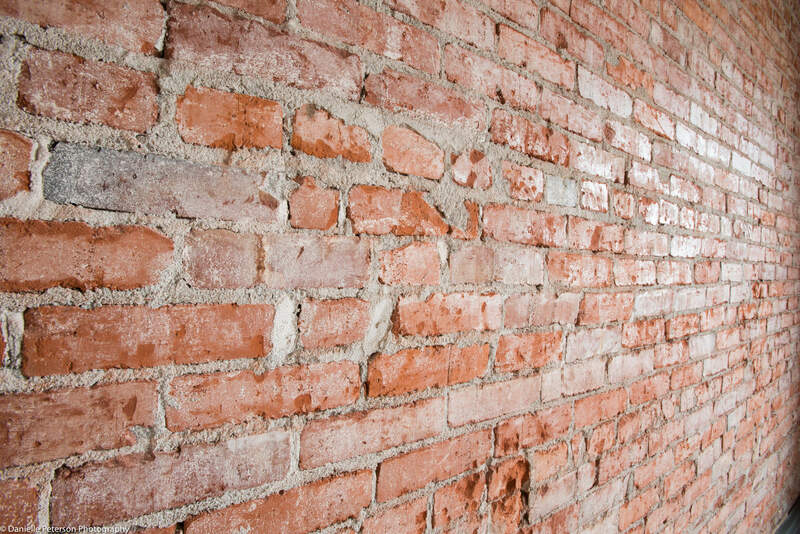 The rough brick walls once would have been considered a utilitarian structural element to be covered with refined surfaces. However, we embraced their roughness as an offset to the amenities they hold. 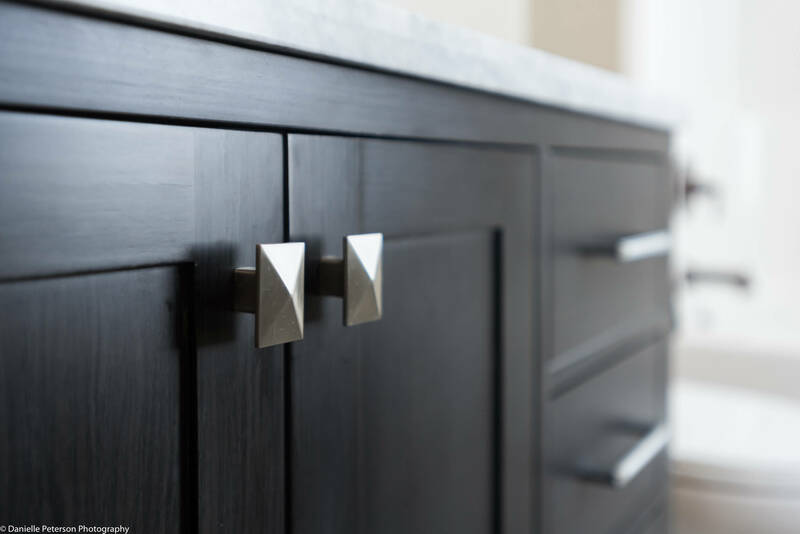 This embrace of the contrast between rough + refined is found throughout the project, in our selection of industrial light fixtures and a color pallet of dark stained wood, antiqued brass, and stainless steel. 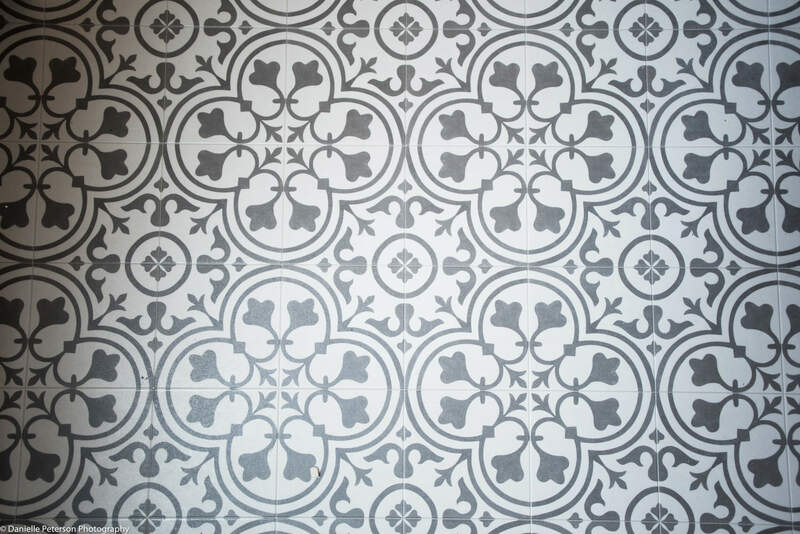 The bathroom flooring is reminiscent both of concrete tiles and of wrought-iron flourishes. The wood floors and stair banisters were sanded and finished to remove the accumulation of time, while preserving the marks of history. The stone south party wall was uncovered and featured much like the brick for its inherent utilitarian beauty. This project provided us with unique challenges and opportunities inherent in old buildings. 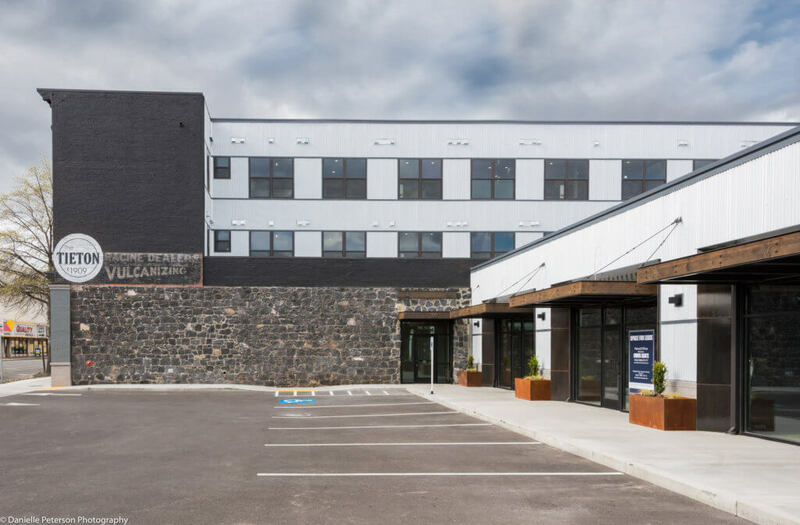 Throughout this project Lenity worked to preserve where possible, and reimagine where required, the character of the building as it may have been in its heyday, all while adding a modern twist, both in aesthetics and, especially, in amenities. Approaching the project like anthropologists or archeologists, we chipped away at the layers of time to reveal the stories the building has to tell – all while providing a venue for new stories to be lived and new history to be made. The name “Tieton” comes from the Tieton river whose waters flow into the Yakima river before flowing around the east end of Yakima, Washington. Tieton is said to mean “Roaring Water” in the language of indigenous tribes. It describes the sound of the river as it flows through the columnar basalt of Tieton Canyon. 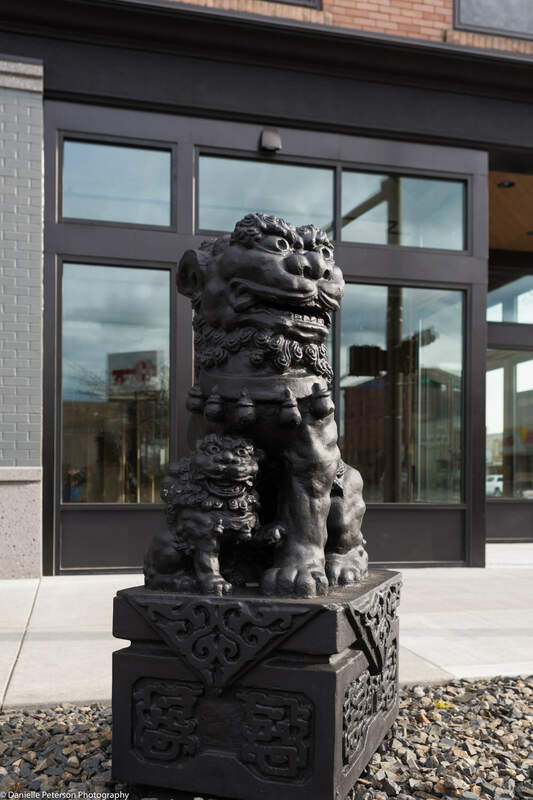 The Stone Lion ( 石獅 – shíshī ) who guards the front entrance is a remnant of the Chinese restaurant which once occupied the ground floor of the Tieton. Her companion lion went missing before the project began, but it is rumored that he still prowls somewhere in Yakima. She needed a bit of care, but now she and her cub proudly guard the entrance to a palace worthy of her grandeur.